School is out; Summer is here; and, the perfect thing to wear is a sundress. In particular, two Girl’s Easy-to-Sew Sundresses. 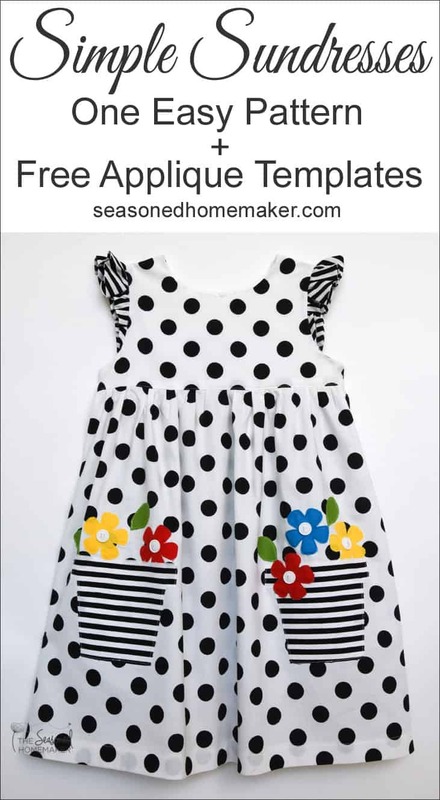 I’m going to show you a few simple tricks that you can use to take a girl’s easy-to-sew sundress pattern and embellish it with my FREE appliqué templates. Scroll down to see how you can get these templates! As a seasoned Mom, Grandma, a sewist, and a life-long resident of Texas I have sewn my share of sundresses. I can tell you that not all girl’s sundress patterns are the same. Dresses that tie at the shoulder can come untied. Square necklines tend to slip off the shoulders. Criss-cross and halter styles always gap either in the front or back. 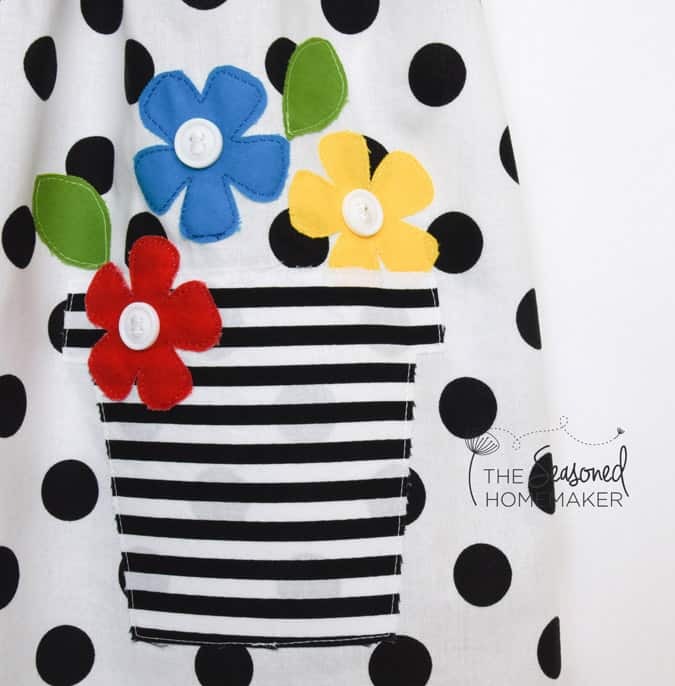 After sewing several different sundress styles for my almost 4 year old granddaughter, I have landed on one pattern ~ the ever-versatile Geranium Pattern from Made By Rae. It’s a classic style that properly fits a little girl’s body. There is no slipping or sliding, and it suits a child’s active life, too. As far as girls dress patterns go, it’s pretty straight forward and I can sew a little dress from start to finish in about an hour. Recently, Rae added a Geranium Expansion Pack which stretches this pattern further and allows for even more creativity. I’ll be adding this to my collection as soon as the weather turns. It includes sleeves and collars. For my first sundress I used an inexpensive seersucker that I purchased at Joann’s using a coupon. Seersucker is lightweight and sews up without much difficulty. The only challenge is the occasional thread pull. As long as you don’t do a lot of seam ripping, it shouldn’t be a problem. The bodice lining and strawberries are from a fat quarter of pink quilting fabric. The white seeds and leaves are from scraps of fabric I had in my stash. Because seersucker is so lightweight, I knew I had to be careful with the fusible web product. For both dresses I went with a very lightweight fusible web product called Soft Fuse (affiliate). It is ideal for this type of application because it doesn’t change the way the dress hangs. I debated whether I should use a zigzag or straight stitch to secure the designs. I started by zigzagging the strawberries, but switched to straight stitch on the seeds and leaves. In hindsight, I think I would’ve preferred everything to be straight stitched, especially on the seersucker. Remember, if you do use a zigzag stitch you will need to add a lightweight tearaway stabilizer (affiliate) to the back. That won’t be necessary with straight stitching. For my second sundress I wanted to make a Party Dress for my granddaughter’s upcoming 4th birthday. The black and white stripe was purchased on Etsy. (affiliate). 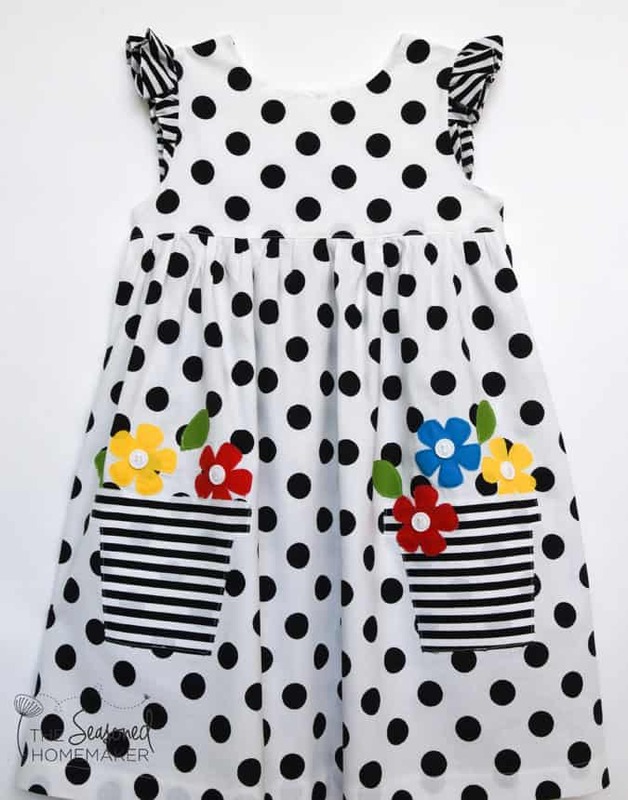 The black and white polka dot (affiliate) is available on Amazon. A white fat quarter worked perfectly for the bodice. For the flowers and leaves I cleaned out some solids from my stash. The $1 buttons are from Joann’s. The Geranium Pattern includes flutter sleeves that are zigzagged on the edge. Because this is a party dress, I didn’t want anything too casual. Instead, I cut out a second pair of flutter sleeves and sewed them together using a 1/4″ seam allowance. Then, I then attached per the pattern directions. In hindsight, I think I would’ve preferred one layer of fabric with a double turned hem. On both dresses, the main fabric does show through the applique. I debated whether I should line these, but ultimately decided that it wasn’t necessary because I was trying to keep both dresses lightweight. Adding another layer of fabric would defeat that entirely. The thread used can be found in this Aurifil Collection called Wildflower Meadow. (affiliate) It’s like a magic box of threads because every time I need a specialty color, it appears in my box! Florence Eiseman Children’s Clothing deserves all the design credit for these two sundresses. A while back I pinned two of her dresses to a board I keep for little girl’s ideas. The dresses have since been discontinued but would have sold for about $100 each at Saks. Check them out for other classic ideas. I am particularly drawn to the ladybug appliqué! 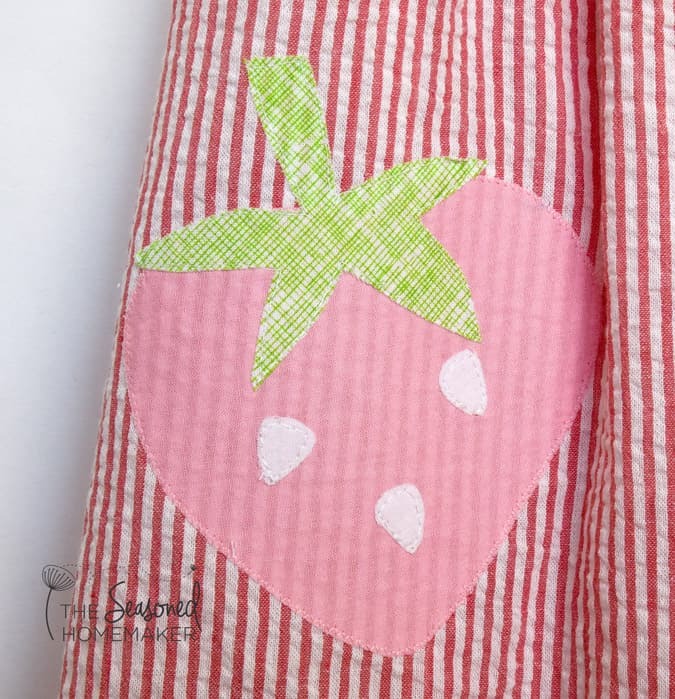 Applique is a fun and easy way to embellish a simple pattern. It doesn’t require an expensive sewing machine or specialty tools. Some scissors and an iron are all you need. You can learn more about appliqué here or check out my eBook, Appliqué Made Easy. If you’re new to applique then you’ll want to watch the applique basics video posted below. Oh, goodness! 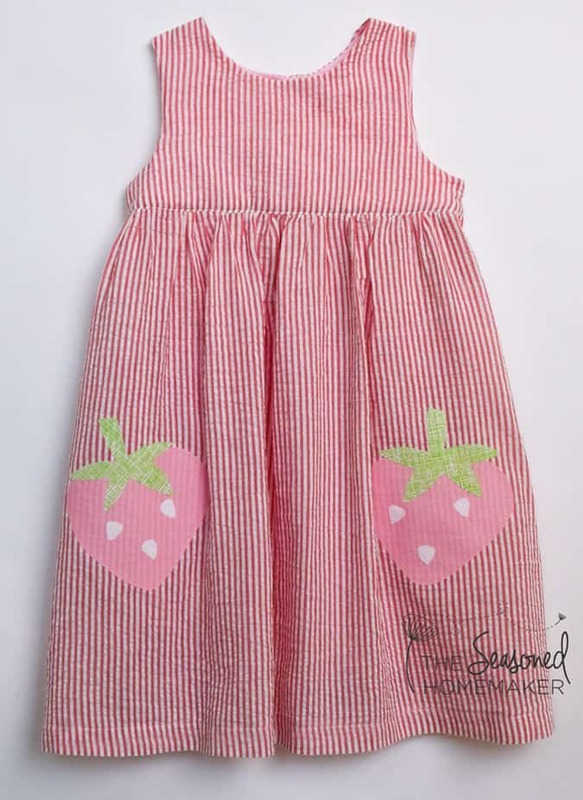 I didn’t think any sundress could be sweeter than the black n’ white, and then you posted the strawberry striped…just precious! Lucky little granddaughter. I can’t even decide which model is cuter. I love, love, love the fabrics you used for these dresses. I have a very similar pattern. Never think about adding such cute appliques. I have one little granddaughter left to sew for and she loves dresses. Thank you so much for sharing. I just made a red polka dot geranium dress and now working on the second one, the white/black polka dot one. For the appliquées this time I ironed them on and blanket stitched around them using matching colour Madeira rayon embroidery thread in the needle and bobbin thread stayed white. It was so smooth to do this time. I did all the appliqué work before even sewing the front skirt to the back and no gathers means it is way easier to maneuver the fabric around all the curves in the petals and leaves! There is a link to the Geranium dress below the first image. 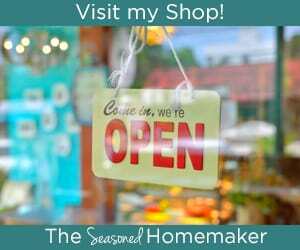 Hi Leslie, I’m so happy to have found your blog. I’m beginning to learn more about sewing — and I specifically would like to learn how to sew clothes for children. I have so many sweet memories of the adorable dresses that my father’s cousin — who was (and still is) a very talented seamstress — would lend to us when I was a little girl. I love this post! I’m pinning it now to keep on my inspiration board. Thank you!